THE STORY: Dylan Morrissey forgoes the traditional and family oriented Shifter Yule celebrations to continue his work to eventually free the Shifters. When Dylan comes to New Orleans and the haunted house, he is treated to a vision of the past, present and future which challenges his priorities. OPINION: I really enjoyed the twist on the Christmas Carol story. Instead of being a scrooge who needs love and compassion in his heart, this Christmas Carol is about Dylan moving on from the past to see that he cannot do everything alone. The guides on his journey, Ben, Zander and Tiger, are all funny and perfect for their roles. I especially liked that Dylan is compensating for his own feelings of being a failure and trying to “fix” his mistakes. But, of course, Dylan ends up making so many more mistakes. The best part of this novella is getting to see so many of the characters from the series and getting updates on what is going on in their lives. This is a very nice Christmas novella that works especially well for fans of the series who will enjoy seeing what is going on with the characters. WORTH MENTIONING: I always appreciate that the novellas move the overarching story forward and are not just asides. Here, there will clearly be long term consequences of Dylan’s recognition that he cannot save the Shifters himself. 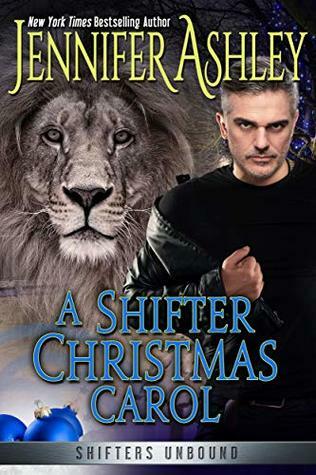 CONNECTED BOOKS: A SHIFTER CHRISTMAS CAROL is book 11.75 in the Shifters Unbound series. The story here is self-contained, but it much more rich if a reader is familiar with all the characters from the Shifters Unbound series who make appearances throughout the story.